How much should you expect for your hand or finger injury traffic accident claim? Clearly, it depends on the type of injury. The average jury verdict in finger and hand injuries is approximately $630,000. This is national data over the last ten years. The median [what is a median?] is approximately $70,000. What does this tell us? It means that there are a lot of very significant hand injury cases that are life altering that have extremely high values and a lot of smaller cases that are severe yet not catastrophic. Scaphoid bone fractures: The prognosis for these fractures can be guarded because there is limited blood supply to a part of this bone which increases the settlement value of these cases. Scapholunate ligament injury: The scapholunate ligament is a critical stabilizer of the scaphoid and lunate carpal bones. 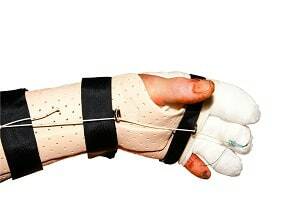 Permanent injuries drive settlement value and these injuries can leave victims with reduced grip strength and arthritis. Bone graft: If the fracture does not heal properly and a bone graft is required, long-term prospects for that hand are usually not very good. Internal Fixation: Hardware in the hand or wrist is usually a harbinger of a less than optimal outcome. Severe Impact: Plaintiffs' lawyers sometimes pretend the severity of the crash has nothing to do with the injury to the occupants. This is not the case in hand and wrist fracture cases. Higher energy injuries do more damage to the bone and soft tissues around the bone and are more likely to have nonunion than a low energy fracture that might occur from a fall. The problem with looking at settlement and verdict statistics is that you have no idea where you fit into the statistics. You can't possibly know where your injury fits in the big picture. Below is a list of verdicts and settlements in hand injury cases to give you a better idea of the values of these cases. Some of these verdicts are Miller & Zois verdicts. Others were handled by other lawyers in Maryland and around the country. The hope is that this gives you a little better idea of the value of your case because you can compare your claim to others and make a reasonable comparison. That said, you should go down this path with great caution. First, we are cherry picking good verdicts so the verdict might not be reflective of the average value of your case. Second, there are so many variables that go into the value of a case; it is hard to put those pieces together in a short little summary. It could very well be that the biggest factor in the verdict or settlement is a fact that is not listed in this summary. 2018, $375,000 Verdict. Group of Food Lion employees are carpooling to work on Route 26 in Sykesville when they get struck by defendant driving a dump truck and making an errant right turn onto Route 26 from Liberty Road. One of the passengers suffers from head trauma and a fractured hand. A Carroll County jury awards $375,000 in pain suffering damages. 2018, $22,387 Verdict. A 55-year-old substitute teacher is a rear seat passenger in a car at the intersection of Ritchie-Marlboro and Brown Roads in Upper Marlboro when the car is broadsided by the defendant. Plaintiff suffers fractured finger and body bruising and sues the defendant for negligently ignoring a stop sign. Liability is admitted and the case goes to trial on damages. A jury in P.G. County awards $22,387. 2013, $19,898 and $34,031 Verdicts. Plaintiffs are riding in a car when defendant crosses two lanes and runs into them, head on. The driver suffers a right-hand laceration as well as soft tissue lumbar and knee injuries. The passenger receives a fractured sternum. A Baltimore County jury awards the plaintiffs $19,898 and $34,031. 2102, $390,000 Settlement. After an afternoon motorcycle ride with friends, the Plaintiff is driving home traveling in the far left lane on the inner loop of the Baltimore 695 Beltway. The defendant is driving a company truck with safety lights on the top of the cab. Inexplicably, he does a U-turn through an emergency cut-through and pulls directly into the path of Plaintiff's motorcycle. Plaintiff suffered multiple rib fractures, abrasions, and cuts, as well as a right anterior tibial wound. But his worst injury might have been a comminuted fracture of the left elbow and comminuted left thumb metacarpal fracture requiring hardware and pins. Our law firm, Miller & Zois, handled this case. 2012, $80,000 Settlement. A beautiful and very sweet college girl is driving down East-West Highway in Prince George's County. She is hit head-on by a car, insured by Allstate, traveling in the opposite direction. She breaks her wrist, requiring a cast on her right arm. Our law firm, Miller & Zois, handled this case. 2012, $1,045,898 Verdict. Plaintiffs are longtime friends who are hanging out at a bar. The two men get into a fight, which moves into the parking lot. During the scuffle, defendant bites off the tip of plaintiff’s index finger. Can you imagine? Plaintiff undergoes many surgeries to protect the protruding bone. Plaintiff sues the man who bit him as well as the restaurant owners, alleging that they were negligent in not providing proper security. The restaurant argues that they provided proper security and that incident was the result of third-party factors that they could not control. This is a pretty good argument, really. It is hard to control grown men who choose to fight. Anyway, the "biter" never shows up for court and a Montgomery County jury awards $1,045,898 in damages against this absent defendant. But the restaurant receives a defense verdict. We put this in because it is an interesting case. But this is one of those verdicts that sounds good but the actual recovery for the plaintiff is zero. It underscores the fact that you need an insurance company or someone with assets behind any verdict you might get. 2011, $22,500 Verdict. Plaintiff’s vehicle is rear-ended at a red light. She is taken to the emergency room, where it is later discovered she suffered severe strains on her right hand. She develops severe hand pain and wears a hand cast for three weeks. Plaintiff also pursues UM/UIM benefits from her carrier, State Farm. Plaintiff claims that defendant - insured by Agency - failed to keep and look out and was following too closely. Defendant shows pictures of the minimal car damage and alleges that the injuries were from a pre-existing condition. Nevertheless, an Upper Marlboro jury awards a $22,500 verdict. 2011, $1,598,500 Verdict. Plaintiffs are shopping at Nordstrom when they, incredibly, came under attack by a disturbed homeless woman. The woman had taped four butcher knives together and spontaneously began attacking the sales representatives and customers. Just a crazy thing. The woman attacks the Plaintiffs who receive numerous stab wounds leaving scars, PTSD, and limited use of their hands and arms. The woman’s rampage ends when an off-duty FBI agent pulls out his revolver and orders her to stop. Where is the negligence? Plaintiffs sue Nordstrom arguing that the store was negligent for failing to warn adequately and evacuate the store when they became aware of the dangerous situation. Additionally, they note that though provided with a training manual for such incidents, the staff was never trained to handle it. Defendant claims the attack was a random act of violence that they had no control over and that they had provided all reasonable measures to ensure the safety of its patrons. A Montgomery County jury awards $1,598,500 to the two plaintiffs. 2010, $50,813 Verdict. A teenager is leaving his home and traveling down a slight hill on Summit Avenue in Rosedale when he encounters one of the defendant’s storage containers. Because oncoming traffic prevents any chance of avoidance, the plaintiff collides with the container, fracturing his hand. Plaintiff alleges that defendant was displaying a reckless disregard for public safety by failing to mark adequately the containers in the middle of the road, even after several resident complaints. Defendants claim that the container on the roadway was an open and obvious condition. A Towson jury awards $50,813 to the plaintiff. 2005, $377,000 Verdict. Plaintiff, a nurse, broke her wrist in a fall in snow and ice during a blizzard. She incurred over $6,000 in medical bills. State Farm offered $18,750 to settle the case. An Anne Arundel County jury awarded nearly 20 times State Farm's offer. Our law firm Miller & Zois handled this case. Below are hand, finger and wrist settlements and verdicts throughout the United States. For whatever reason, these verdict and settlements seem much lower than you would expect for hand injuries, not even getting back to the $70,000 average settlement we talked about above if you pull out that $1.9 million settlement that involved a lot more than a hand injury. Certainly, hand injuries vary wildly in severity, and this sampling seems to be with the cases on the smaller side. 2017, South Carolina: $87,500 Settlement. A man in his 50s is operating a vehicle on the highway when it is broadsided by another vehicle. As a result, the man injures his hand. At the hospital, he is diagnosed with a fracture of his right hand. This diagnosis is followed by therapy and orthopedic surgery. He brings a suit against the other driver, alleging negligence in the operation of his vehicle and the failure to yield the right of way. The defendant does not contest liability but disputes the injury causation and argues that the man had a pre-existing condition that was simply aggravated by the accident. The parties agreed to settle for $87,500, with a portion coming from the defendant's insurance policy and a portion from the plaintiff's underinsured motorist coverage. 2016, Georgia: $30,485,664 Verdict. A 29-year-old woman is driving her vehicle when a Jeep, traveling in the opposite direction, crosses the center line of the road. The woman's left-hand crashes through her driver's side window and strikes the Jeep which proceeds to scrape down the side of her van. The plaintiff is diagnosed with a crush injury to her left hand and closed fractures of her left ulna and radius. She has multiple surgeries to her hand and loses a significant amount of tissue from her hand, including nerves and tendons. She has a four-stage reconstructive surgery done, which includes a skin graft from her thigh. Her middle finger is amputated, and she has plates and screws implanted into her forearm. The woman sues the driver of the Jeep, alleging negligence in the operation of her vehicle. The defendant's claim that the steering control inside the Jeep malfunctioned as was the cause of the accident. A jury found that the defendant was 100% liable, and awarded the woman $30,485,664.29. 2016, New York: $1,900,000 Settlement. A man in his 50's is working with his co-workers to move a 600-pound vacuum feeder tank down some stairs to replace parts of the boiler. While transporting the tank, his hand becomes jammed. As a result of the incident, he has to have his ring finger amputated at the base and half of his middle finger amputated, despite multiple hand surgeries. He additionally suffers a cervical herniation requiring surgery along with PTSD. It is hard to say how much of this settlement was the hand injury versus these other injuries. The man claims he is no longer able to work, while defendants claim that there are many alternative jobs he can do. Before trial, the parties settle for $1,900,000. 2016, Washington:$140,000 Settlement. A 74-year-old woman is in the back seat of a vehicle. Defendant's vehicle fails to yield the right of way at a stop sign and collides head-on with the plaintiff's vehicle. As a result, the woman sustains a hand injury and fractures her left thumb. She also sustains a compression fracture in her thoracic spine and alleges she needs a surgical fusion in her sacroiliac joint. The parties settle the case for $140,000. 2016, Nevada:$50,000 Settlement. A newborn infant suffers an injury to his right hand during his birth at the hospital. His parents file a case against the hospital alleging medical malpractice was the cause of the injury. The parties settled for $50,000. 2016, Washington:$21,000 Settlement. A woman is walking around her apartment complex when the defendant's dog, a terrier mix, bites her. She alleges that the dog bit down on her right index finger while she tried to stop the dog from attacking her. As a result of the dog bite, the woman sustains a one-inch laceration and wounds on her right index finger that requires six stitches. She also alleges complex regional pain syndrome as a result of the bite. The parties settle for $21,000. 2016, Texas:$19,329 Settlement. A minor child is attending defendant daycare facility when a gate closes on his hand. He suffered hand injuries as a result. His mother files a claim against the facility, alleging their negligence resulted in her son's injuries. The defendants deny liability but ultimately settle for $19,329.46. 2016, Connecticut:$14,502 Verdict. Plaintiff is employed by a defendant who is a contractor. Plaintiff's job involves mixing cement. While mixing the cement day, part of the mixer gets clogged. The man attempts to unclog the mixer with a stick, but his hand gets caught in the machine. He sustains severe injuries to his right hand and has surgery. A judge awarded the plaintiff $14,502 in his premises liability lawsuit, finding the defendant was negligent. 2016, Washington:$14,437 Verdict. Plaintiff is driving his vehicle eastbound at the same time that defendant is operating his vehicle westbound. Defendant fails to yield the right of way and attempts to make a left-hand turn in front of the plaintiff's vehicle. The vehicles collide, and the plaintiff injures his left hand, fractures his pinky, and has back pain. He has to see an orthopedist due to his finger injury. The man was awarded $14,437. 2016, New Jersey:$7,500 Settlement. A seven-year-old girl is a student when a teacher at her school closes the classroom door on the girl's hand. The girl suffers a hand injury as a result. Her mother brings a claim against the school, alleging negligence and carelessness on the part of the teacher. The parties settled for $7,500. 2015, Alabama:$110,000 Settlement. A 52-year old man is working as a pipefitter for the defendant's company. While working, a clamp falls on his right hand. As a result, he is left with an impairment rating of 39% in his hand after over $12,000 in medical treatment. The parties settle for $110,000, which is representative of $64.02/week for the remainder of the man's life. 2015, Florida:$78,751 Verdict. Plaintiff is a passenger in a vehicle traveling on a highway in Miami. The defendant is using a ladder to repair some utility lines, but he fails to secure it to the utility pole. Suddenly, defendant's 14-foot 90-pound ladder falls, striking the plaintiff's hand. 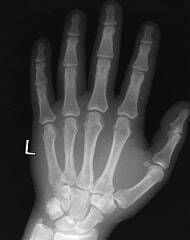 The plaintiff files this case, alleging that the impact resulted in a fracture to his pinky that requires surgery. The defense argued that the imaging studies revealed an old, previously healed fracture. A jury awarded the plaintiff $78,751. 2015, Washington:$45,609 Verdict. A 52-year-old man is driving his vehicle. He is completely stopped when defendant's vehicle strikes his vehicle in the read. As a result, he is left with tendon damage in his third finger. A jury awards the man $5,609 in medical expenses and $40,000 in non-economic damages. 2015, Washington:$42,790 Verdict. A 65-year-old retired woman falls in a parking lot while waiting to get on a bus ten days after a severe winter storm. The woman claims the parking lot was not plowed or sanded and was slippery. She fell onto her back and was unable to get up until a witness came to help her. While walking towards the bus, the woman and the witness both fall again. As a result of the falls, the woman injured her hand, sustained a right thumb sprain, knee contusions, and lower extremity edema. A jury awarded the woman $29,895 in medicals and $12,000 in non-economic damages. 2015, Washington:$28,092 Verdict. A woman is holding a wine glass when an object falls from a shelf above her and shatters the glass in her hand. Her hand is cut open. She goes to the defendant's emergency room, with pain in her fingers and up to her elbow. The plaintiff is found to have a laceration in the palm of her left hand and superficial lacerations to two fingers, but no tendon laceration or foreign body is found due to radiological studies not being ordered. Fourteen days later, the woman returns to have her stitches removed, and no diagnostic tests are done even though the woman has no movement in one of her fingers. These symptoms continued for a few weeks. When the woman develops a mass in her left hand, she goes to an orthopedist who orders x-rays and finds a foreign body between the plaintiff's fingers. She has surgery done to remove the two foreign bodies and claims the doctors in the emergency room were negligent. She suffers an injury to her dorsal EDC tendon and is still unable to bend her fourth and fifth fingers together. A judge awards the woman $25,000 in non-economic damages and $2,247 in medical expenses. Losing use of hand or having great pain in it is a tough thing. Our firm knows that because we have handled many of these cases. We fight - hard - to get our clients who have suffered severe hand injuries the money they deserve, either by settlement or at trial. Our lawyers handle serious injury claims. Call us to discuss your case at 800-553-8082 or get a free consultation online. What can you tell me about the value of my case?